Hailing from the fertile musical ground of New Jersey, guitarist Fred Gorhau has been a constant fixture on the New Jersey/New York metal scene for over twenty years. Though steeped in the long tradition of '80s Power Metal, for the last six years Gorhau has been spreading his wings musically and geographically as part of the Yuletide rock ensemble The Wizards of Winter. I caught up with Fred as he and the band are rehearsing for their upcoming 2016 holiday tour. 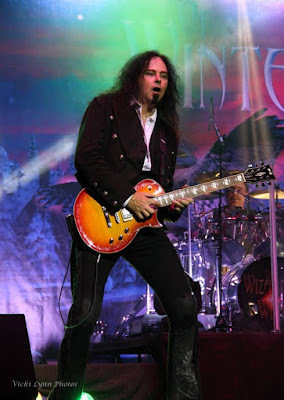 Fred talks about his history with The Wizards and what it's been like working with many of the former members of Trans-Siberian Orchestra as well as being managed by metal legend Jon Zazula. We also discuss his long association with the Power Metal band Exxplorer, his current work with Dark Sky Choir and Living Colour's Corey Glover. Dan Roth: When did you start playing guitar? Fred Gorhau: I was about 13 years old. My father lent me the money - $45 at the time - and I paid him back $5 a week out of money from my paper route. I would say it was well worth it. DR: Any particular bands or albums that inspired you early on? FG: KISS was probably my favorite band growing up. They were just so influential. As I got older I started getting into Rainbow, AC/DC and bands like that. DR: Do you recall what the first song was that you learned to play on your guitar? FG: "Day Tripper" by the Beatles. My neighbor at the time had a nephew that had already been playing. He came over to her house, was playing and I said, "I have one of those!" [Laughs] He taught me how to tune it and how to play "Day Tripper" and I never looked back. DR: From a technical standpoint, is there one guitarist that influenced your playing? FG: Although I was a KISS fan for the longest time, I quickly gravitated towards Ritchie Blackmore. His classically influenced sound, alternate picking and his use of modes really sounded different to anything I had heard. As a teen, I got into Rainbow with Ronnie James Dio. Blackmore wrote a lot in harmonic minor and Dio's writing really complimented that. After Blackmore, I gravitated towards Eddie Van Halen which was a game changer and then of course Yngwie Malmsteen. DR: Do you still practice and work on your scales? FG: Yeah, I do. I think it's important. When Randy Rhodes was touring with Ozzy, he would still stop and take lessons when he had a day off. I still take lessons when I can. There is always room to learn new things and make yourself better. As recently as 2015, I was taking skype lessons from this monster guitar player in California named Dave Nassie. He really helped me out a lot. But yeah, I still practice my scales because you can lose some of the control and attack if you don't practice them often. 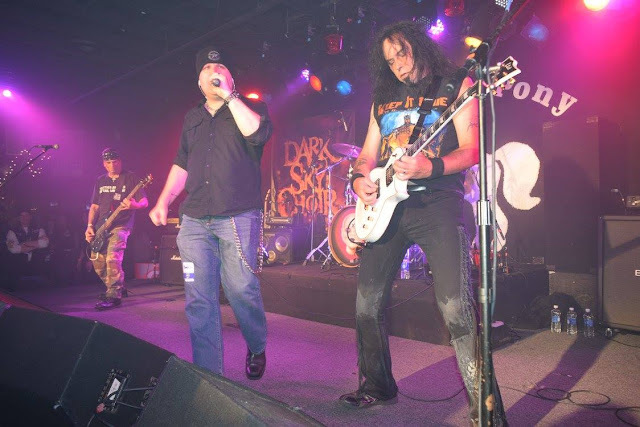 DR: Starting in the 1980's, New Jersey had a large presence on the metal scene, with Jon Zazula's legendary Rock N Roll Heaven record store, his label Megaforce Records, Metallica recording and living there, and the incredible support that the area gave to metal bands. Were you involved in that at all? FG: I wasn't part of the original Old Bridge Metal Militia, but that scene definitely was huge in my life. I would go to Jonny Z's record store and pick up all of the import metal records that were coming out at the time. I remember picking up the new Angelwitch record, the new Accept record, the new Motorhead record. That scene with Jonny's record store and then his label being at the middle of it all was what we knew growing up here. DR: Were you involved in a lot of different bands as you were spreading your wings with your playing? FG: I was in a few different cover bands. I was in a band called Push in the '80s and we had a pretty big following. We did the whole [legendary Brooklyn rock venue] L'Amour scene and opened for many of the national acts that came through L'Amour. We opened for Kix, Extreme, Dangerous Toys, Kings X. We must have opened for Blue Oyster Cult a dozen or so times. Push was pretty much my first venture to playing outside of the basement. DR: For many metal fans outside of the NJ/NY area, their first taste of hearing you play was when you joined Exxplorer. They had an interesting but sporadic history. You joined them for their third album? I auditioned that night and got the gig. We then went into the studio to record the band's third album, Coldblackugly. That album featured a new lead vocalist and the songs on it were not classic-style Exxplorer. I like the music on it and I like the vocals, but looking back on it, it probably should not have been an Exxplorer album. It was a lot closer to a Tool or Marilyn Manson record than it was Exxplorer. The album was well received to those who like that style, but it did not go over well to Exxplorer and Power Metal fans. They were a great band though. I was with them for twenty years and played in Europe three different times with them. DR: It often seems to be the case that metal bands have larger followings in Europe than here in the U.S. Was that true of Exxplorer as well? FG: Oh yeah. When we played here, we would play for 200-300 fans. In Europe, we were playing small and medium-sized festivals with thousands of metal fans. In Europe, music is part of their lifestyle. They book their vacations around the festivals - the small ones and the big ones. DR: You mentioned that Coldblackugly got away from the Exxplorer sound, but it seemed to be back with a vengeance with the 2011 album, Vengeance Rides an Angry Horse. FG: We had taken a bit of a hiatus - 10 or 12 years and getting back together was all because of some renewed interest in the band over in Europe. DR: The reviews for that album were great. Comparisons were being made to Omen, Jag Panzer, Accept. Possibly most importantly, it was being favorably compared to the band's original sound. FG: Musically it definitely was in the right direction for the band and even the production resembled the earlier albums. It's honest, it's raw - all in all I think it's a very good record. Songs are really strong and it's complete old school '80s metal. DR: Is Exxplorer still active today? FG: I'm not sure. They did a festival a year or two ago. I'm no longer with them; they are back with their original lineup and I think that's the way Exxplorer should be. I think they are a better band without me in it. DR: That's a surprising and honest thing to hear. FG: Well, I ran into some over-playing things with them. I don't think they always agreed with how I played or do things that I thought belonged in the songs. It's a little different with the Wizards where I can work on a song or a riff, send it to Scott to see what he thinks and often I will get a message back that says, "Sounds great! Can you do it in harmony?" [Laughs]. I can spread my wings with The Wizards where I felt a little stifled with Exxplorer. DR: Speaking of The Wizards of Winter, tell me how you came to be a lead guitarist with them. FG: I was looking for a side project and stumbled upon their ad. The first time I contacted them, it didn't quite work out because they were just rehearsing and I was looking for a paying gig. As luck would have it, about a year later after their first tour, they put another ad out. At that time, I was a little better financially and could afford to do a side gig and not get paid. Of course, they started out as a charity and there was no money. DR: This is when they were still strictly a Trans-Siberian Orchestra tribute band? FG: Yes, mainly a tribute band and we were playing churches to raise money for food pantries and the like. It was a great gig because I always loved TSO's music and this was a cool opportunity to play some of it for a good cause. Plus, available gigs tend to dry up a bit around the holidays. DR: Is there any TSO song that you particular enjoyed playing? FG: Nothing stands out. I enjoy playing most of them really. They are fun songs to play and well-written. DR: The Wizards of Winter are now a full-fledged original act. Talk about that transition. FG: We were getting so many requests from fans at our shows asking where they could purchase our album. Of course there wasn't one. Scott Kelly, our keyboardist and musical director, had already been working on some original demos to mix in to the show so we started working on those. It was really a natural progression. We released our self-titled album in 2014 and everyone seemed to like it. We went right back into the studio and started work on the second record, The Magic of Winter. That record took us seven months to write, record and release it. We felt that was pretty good because there are some bands that take years to release albums. I am really proud of it. DR: Your original music is a mixture of metal, progressive rock, and even some ballads. As a long-time metal guitarist, do you enjoy playing such a diverse set of genres? FG: I actually do. That diversity helps keep me interested and enthused about playing this music. For example, there is a beautiful ballad on the The Magic of Winter that Mary McIntyre sings ("I Am Here") that is primarily piano and flute and then the bass and drums kick in. I had to write a solo for it and it was a great opportunity for me to write just a nice melodic solo that fit the song. It wound up being one of my favorite solos on the record. DR: The band has certainly grown over the years to the point now where you are on the calendar for many concert-going fans during the holiday season. Have there been many growing pains? FG: Well there is always the comparison to TSO and that's fine. I know from talking to some of the original TSO members that they went through a similar thing with Mannheim Steamroller when they were first coming out. They had people telling them that they were crazy for trying because Mannheim Steamroller had the Christmas live scene locked up. Plus, trying to expand geographically gets expensive. Even though we don't have the huge production that TSO has, we still travel with a crew of twenty and you can't just easily throw the guys and equipment in the back of a van and head out. We are still self-financed and pay our own way. We don't have an investor that dropped six zeroes on us. DR: You have mentioned how much you like TSO and enjoyed playing their music. Even though you got a great response from the audience doing that, is it more satisfying playing your own guitar parts rather than Al Pitrelli’s? FG: Absolutely. It's always better playing your own stuff. DR: Starting with the 2013 tour, you caught the attention of many of the legendary fan-favorite performers who were part of TSO for many years. So far, five former TSO members (Tommy Farese, Tony Gaynor, Michael Lanning, Guy LeMonnier and Joe Cerisano) have toured with you. What have they brought to the table? Have you enjoyed working with them? FG: I have enjoyed working with them, for sure. One of the main things they brought to us besides their talent was their experience. Not all of the Wizards members had a touring background. 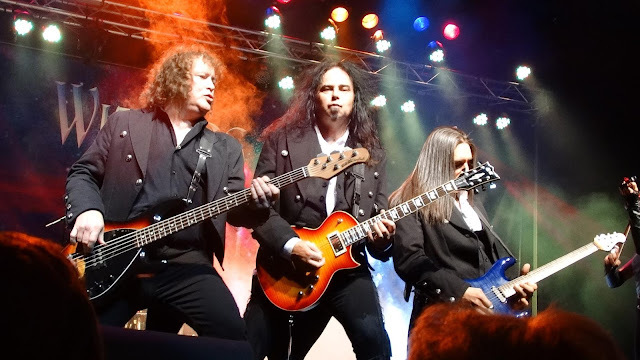 The former TSO guys were all there on those early TSO tours and they had gone through it with them, so they helped us navigate what to expect a bit. They also helped us with some of our live sound expectations. Most bands tend to speed up a lot of their songs when playing live. Tommy Farese in particular helped us realize that we need to slow down the TSO songs a bit because of how the sound comes back at the audience in the larger theaters we were have been playing. If you play it too fast, the audience winds up hearing a mish-mosh, especially with two keyboards, two guitars, flute, violin, and the rhythm section, not to mention the multi-part vocals - there is a lot that can get lost and by slowing it down just a bit, it helps it to be a bit more audible to the audience. 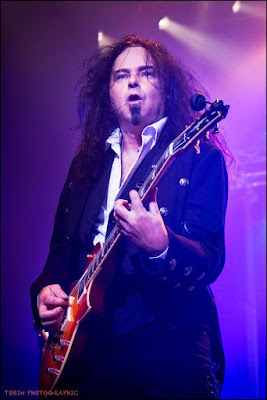 DR: TSO certainly has the reputation for slowing the tempo of their songs down a great deal when done live. FG: When playing their songs, we try not to slow them down too much. But we consciously like to play them at the original tempo that you would hear on the record, and not let the song take off. DR: Guy and Tony eventually became very integral to the band, with Guy taking some lead vocals on the albums and Tony getting very involved with his narration of the concerts. FG: They have meshed so well with the rest of the band. Almost instantaneously, they were excited to be playing with us and playing our music. The funny thing is when they first joined the band, we looked at them as the "rock stars" amongst us, so we almost felt that we had something to prove. Now we are all friends and bandmates and have such a great camaraderie; it's a great place to be. And we are reminded at every rehearsal and concert why they got the gigs that they got - they are supremely talented guys. DR: I understand that there is a core of the band that creates your original songs – Scott Kelly, Sharon Kelly, Steve Ratchen and yourself. How does the songwriting and arranging process usually go for you guys? FG: More often than not, Scott will bring an idea to the table and describe what he was hearing and what direction the song could go in. We get together and hash out the various parts, making suggestions, reworking or adding parts. Scott and I have a unique musical relationship that I haven't had with anyone else. When he starts playing something, I immediately know what the pulse of the song should be. We have a real symbiotic relationship that way and I immediately can get an idea of where we are going with the song and what it needs. I've also come down with ideas for songs and the process works the same way. Often we will wind up with various musical parts and phrases and we collaborate on tying them together. DR: I would like to get your thoughts on a few particular songs from each Wizards of Winter album. First up, let's talk about "March of the Metal Soldiers", which has that huge majestic, regal feel to it. I recall this song was released on Memorial Day 2014, before the rest of the album. FG: Everyone in the band has a real affinity for the U.S. Military. If they don't do what they do and make the sacrifices that they have, we couldn't have the lives that we have. This song is dedicated to them. It's based on the old classic "March of the Toys" and we wanted to rock it up a bit. When Scott started playing it, it felt natural to throw the guitar harmonies on to the beat. The vocal break in the middle is actually the mottos of the four branches of the military sung in harmony in Latin. Towards the end of the song, I came up with the idea to add in some fast guitar runs. Like I mentioned earlier, I recorded these runs and the engineer sent them to Scott to see what he thought about adding them in. Scott loved it and asked to have them done in harmony. It gave me chance to show some of my versatility and it came out great. DR: "Just Believe" is a real fan favorite and sung beautifully as a duet by Mary McIntyre and Guy LeMonnier. This one is such a great power ballad that is really telling a story between the two vocalists and then all of a sudden there is this somewhat unexpected two-minute guitar break that winds up fitting really well within the song. FG: I grew up on so much of '80s rock and you couldn't escape hearing those power ballads that had a killer solo. Here we are doing something reminiscent of that and I wanted to do a solo that followed the chords instead of running scales in one key. There is a lot of string-skipping and tapping that follows the song's chords and once again recorded them in harmony. When playing live, we are lucky to have TW Durfy also on guitar to help bring these harmonies to life. He is such an awesome player that there is nothing where I would have to worry about having written something and wonder if he could play it, because he definitely can. DR: There is a bonus track on that first album entitled "Ode to Eisenach" which is a solo classical guitar piece. FG: That is Bach's "Chaconne", which was originally written for violin but transcribed for guitar by Andres Segovia. There are actually two parts to that piece and when played in its entirety is about fifteen minutes in length, so that wasn't something that would have fit on the album. I edited it down to about three minutes and I made sure to use the cadence at the end of the first movement because it is so brilliant. To me, that piece is the sound of a guitar crying. It is such a perfectly written piece of music and it fit in well with what we are doing. It doesn't necessarily sound Christmassy but I thought it fit in with the mood and I am grateful that it is on the record. As for the name, Eisenach is a town in Germany where Bach was born, which is why I called it "Ode to Eisenach". DR: One of the instrumental highlights of the second album is "Seasons Lament", which has elements of "Coventry Carol" with a little Paganini thrown in. Walk me through that song; I feel like there is lot of you on this song in particular. FG: Yeah, this one does have a lot of me. When we were creating The Magic of Winter album, I had this idea of wanting to combine two darker pieces, with one being Christmas and one Classical. "Coventry Carol" is this 16th century piece that was based on the time when Herod was ticked off about the birth of Christ. He ordered all male children under the age of two killed. "Coventry Carol" is the lament of the mother's sorrow over the death of their children. If you listen to the words - Bye bye, lully, lullay - it is heart wrenching to hear when played really slow. Annie Lennox actually does a rendition that is amazing. I looked at this piece and realize that if you put some heavy guitars behind it and sped it up just a bit, it sounds very, very metal. Of course, I love Paganini and his wonderful Caprice Number 24, so I looked for a way to tie that in. Scott, Steve and I collaborated on tying those two pieces together and I think it came out great. It's short and to the point and it gave me a chance to lay some good guitar parts down. DR: "Flight of the Snow Angels" is song that Guitar World seized upon and highlighted when the album came out and I find makes a superb opener to your shows with the elements of Beethoven's "Ode to Joy" incorporated in. FG: That song was Scott's idea, as well as bringing that "Ode to Joy" bit in there. There is a lot of bouncing, back and forth between the guitar and keyboard parts. This one winds up being a good guitar/keyboard duel, if you will, especially with the climbing arpeggios towards the end. Even though it is an instrumental original, it sounds Christmas. When it first starts with Scott's keyboard playing, it just brings to mind some of those old Christmas kids' specials that we used to watch on TV. DR: "The Spirit of Christmas" is one of the more melodic, poppier Styx-like songs that features a lot of keyboards out front and of course Guy's vocals. Though you get your guitar licks in, it is not one of the heavier pieces that you are used to. Do you enjoy a song like this where your metal style isn't called for? FG: I do! It is such a well-written pop song and so much fun to play. Initially we weren’t discussing having a guitar solo in it. Scott was working with such a cool keyboard sound - that reminds me of the sound that was used in the old Rockford Files TV theme. I loved that sound in the context of this song so much that I wanted him to have that solo instead of a guitar riff. Eventually we decided on both guitar and keys during the solo. Scott takes the first solo on his keys and then we play together for the next one in harmony. Then the solo gets handed over to the guitar. I initially had some shredding ideas that ultimately did not fit the song, so I borrowed a musical idea from .38 Special. If you listen to the end of the solo just before it goes back to the chorus, you will hear me holding a note out and that is completely borrowed from .38 Special. I don't even know of a particular .38 Special song that I am thinking of there, but it is more their feel instead of an Yngwie Malmsteen feel. DR: Earlier you mentioned some of your overplaying issues with Exxplorer and here is an example where you pulled back from that and certainly gave a more restrained, complimentary solo. FG: Yeah. and ultimately shredding guitar would not have fit that song and I think what we all came up with there worked out really well. Sometimes you can challenge the listener too much by saying, "Watch how many notes I can play!" You know what? I can play three and that's all it took because four would have been too many. DR: You filmed a music video for that one, directed by Tommy Jones. Jones regularly works with Testament, Slayer, Lamb of God and so many others with their video work. Did you enjoy working with Jones? DR: A couple years back, the band got noticed by and subsequently signed with Jon Zazula (Jonny Z) for management. Zazula has such a rich history in the music business, with discovering and signing Metallica and so many other legendary bands. Tell me about that experience thus far. Does it change things for the band working with someone that legendary in the music world? FG: Yeah, it was a little bit of a full circle for me - I used to ride my bike to his record store! But no one is more respected in the business than Jonny. It is actually he, Chuck Billy of Testament and Maria Ferrero from Adrenaline PR that make up “Breaking Bands”, and they are a great management company to work with. They have done a great job in increasing our footprint and our name recognition. We used to be primarily a Northeast US band. We haven't gone completely national yet but with their help and guidance, we are establishing ourselves from Florida to the Midwest. 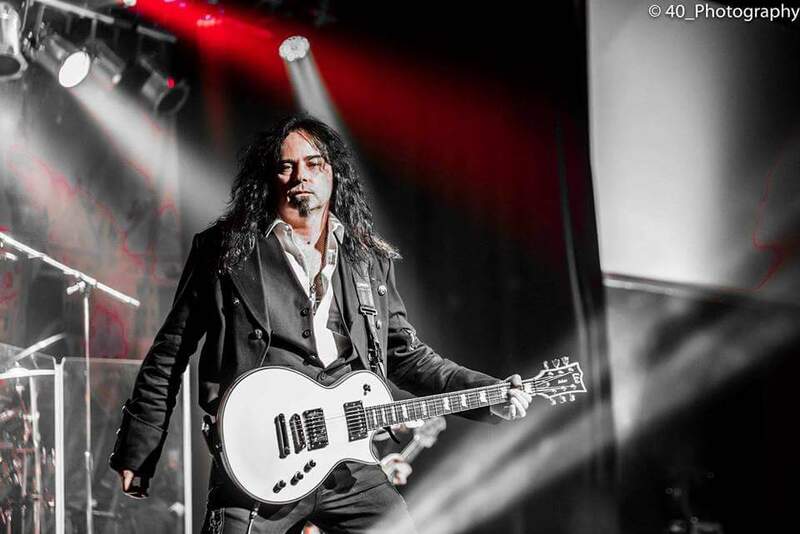 Being involved with them and getting our name out there certainly has helped forge the sponsorship that I have with ESP Guitars. I recently spent some time with Chris Cannella of ESP at the NAMM conference and he has treated me fantastic. I really have to thank him and all of ESP for the amazing level of support. Chris actually told me that he is honored to have me on their roster and I am having a blast playing their incredible guitars. And beginning with this year's tour, Blackstar Amps is now sponsoring me as well. DR: How many guitars do you bring on tour? FG: This year I will have five with me. Fortunately, we do not have a lot of alternate tuning stuff, but certain guitars have their own very distinct sound. Depending on the mood and sometimes even the room that we are playing in will dictate which one I use. Sometimes I might want one with a meatier sound and sometimes I go for a smoother sound. I've got two guitars with EMG pick-ups, one has Duncans and one has DiMarzios. I also have an older ESP that I have had for 25 years that has Seymour Duncan super distortions in it so if I want a good, solid flat-out metal sound, I will grab that one. I usually switch between two or three a night and then have a couple for back-ups. I will be bringing out a brand new ESP USA model that they just built for me. It's got a quilted maple top - it is just beautiful. DR: This will be your sixth year touring with the Wizards. Any favorite venue or crowd over the years? FG: I love the Count Basie Theatre in Red Bank, NJ because it's a hometown gig for me and it is always exciting to play there. As for crowds? I have to mention the audience we had in Maine a couple years ago. They were insane! They were so excited and loud - it was bedlam. After such a long drive up there - and that time the band was still helping with setting up the lights and stage - we were exhausted. That audience at the State Theater in Maine definitely fueled us that night. DR: Any fun memory stand out from your concert experiences so far? FG: Oh yeah! A few years back, as I was playing I spotted a woman in the second row talking on her cell phone. I kneeled down at the edge of the stage and pointed to her, while I am still playing with my left hand. The woman's friend took her phone away and handed it to me and though I couldn't hear the person on the other end, I said to them, "Do you realize that your friend is at a concert and trying to enjoy herself?" [Laughs] That was pretty funny. The audience got a kick out of it because they all saw what was going on. And luckily the woman was great about it and we all had a big laugh in the signing line afterwards. DR: How far in advance do you start getting in the Christmas spirit and working on Wizards music. FG: All year round. It never goes away completely for us. Once the tour ends, we usually take January off and then we wind up back together working on new song ideas, set list changes, and ideas for the next tour. DR: As the theaters and venues continue to fill and your audience has grown so much, do you feel the band has solidified its own identity? FG: There will always be that comparison with TSO because we started out playing their music and that's fine. We are thrilled that we now have our own identity and such a nice, growing base of fans that like what we do and enjoy or music and concerts. Unfortunately, there are some TSO fans that are dead set against any other band other than TSO doing Christmas music. The only thing I would ask them would be "If you liked the Rolling Stones, did you automatically dislike Aerosmith and Guns 'N Roses?" DR: Any changes or something new for the 2016 tour? FG: We are once again performing a complete Christmas set of our original music and we will have a couple TSO songs thrown in. DR: In 2015, the bass duties were split between Steve Ratchen and Ted Nugent's bassist Greg Smith. What can we expect this year? FG: Greg is now our full time bass player and will be playing at all but one show, which Steve will be playing. Greg is such a consummate pro; he is solid and always has the material down. He has played with so many - Ted Nugent, Rainbow, Alice Cooper and so many others - we are thrilled that he wanted to be part of our band. DR: The band is supporting high school marching bands this year? FG: Yeah, we never got away from the charity aspect and we always want to keep giving back. With a lot of schools, they don't always have the money in their budget for instruments and uniforms so we are doing some benefit concerts at some schools to help them raise money to keep their music programs going. DR: Let's talk about what else you are doing outside of the Wizards world. Tell me about Dark Sky Choir. FG: Dark Sky Choir is a band I co-founded whose original plan was to play out and perform some classic old school metal covers; we try and focus more on deeper cuts and some classics. The response from the fans has been overwhelming. We have even started writing our original stuff and we'll see where things go. We will continue booking gigs and playing out but we may also be in studio in 2017 if everything falls right. What has also been great and a bit humbling has been the great response from the metal community. Derek Tailer of Overkill joined us at one show and we did an Overkill song with him and Chris Caffery joined us at another show and we performed Savatage's "Sirens" with him. DR: You also have been playing guitar for Corey Glover of Living Colour. How did you get involved with him and his band? FG: I met Corey at NAMM and we hit it off pretty well. 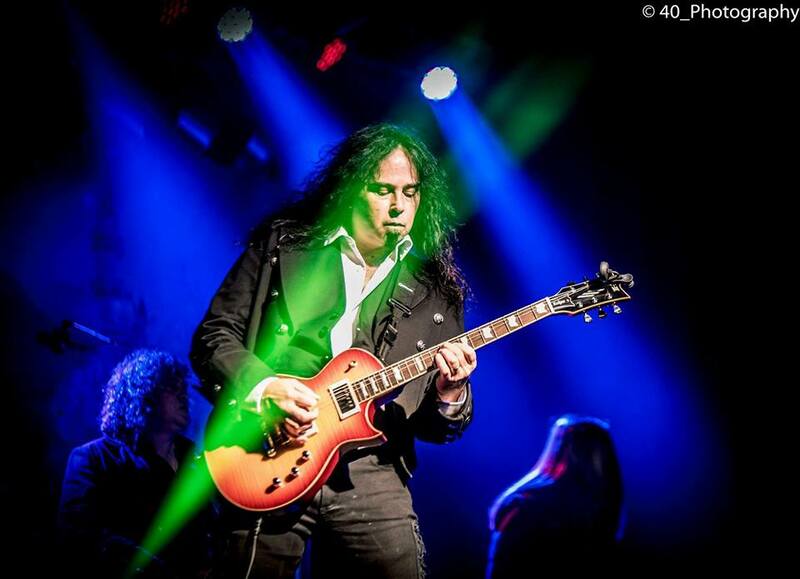 He is pretty busy with Living Colour right now - they just kicked off a European tour with Alter Bridge. But when he does his solo stuff, I get the call. His solo concerts are a blast. Typically we will do "Cult of Personality", "Middle Man", a bunch of songs from his solo repertoire and usually throw in a couple covers. He is such an incredible singer. DR: What guitarists on today's music scene do you admire? FG: I love Alex Skolnick. I also love Michael Romeo - I grew up with him actually. I have to throw in Jeff Loomis, Steve Vai and of course Yngwie. DR: What is one thing about Fred Gorhau that most people wouldn't know? DR: Thanks for taking the time today, Fred! FG: No problem. Happy to do it!